Set in the hills of Puerto Rico in Gran Canaria, Apartamentos Canaima offers great views of the Atlantic from its sun terrace. Its gardens contain several outdoor pools with waterfalls and waterslides. The Canaima apartments feature a private balcony and pay TV. The kitchenette includes a hob, fridge and kettle. The Canaima complex offers mini golf and a children’s playground. There is also a pool table and air hockey. You can drive to Amadores Beach in around 5 minutes from the apartments. The lively resort of Playa del Inglés is 20 minutes away, and Gran Canaria Airport is 35 minutes’ drive away. Just 220 yards from Amadores Beach, on the Costa de Mogan, the Gloria Palace Royal features an infinity pool with sea views. Built from natural stone, the hotel offers spacious rooms with a private balcony. The popular resort of Puerto Rico is 15 minutes away by foot, with many shops, bars and restaurants. Gran Canaria Airport is a 40 minute drive from the hotel. Modern, air-conditioned rooms offer sea views from the furnished balcony. They come with satellite TV, a bathrobe and slippers. Gloria Palace Royal’s spa offers an indoor pool, hot tub and gym. There is also a ping-pong table. 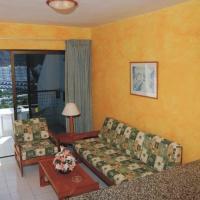 Apartamentos Rocamar are set in Gran Canaria’s Puerto Rico, a 15-minute walk from Amadores Beach. The complex has an on-site cafe, grocery store and an outdoor swimming pool, heated in winter. Each Rocamar apartment has a furnished terrace and a well-equipped kitchen. Apartments feature simple, wooden furniture and tiled floors. The Rocamar Apartments are within 10 minutes’ walk of lively central Puerto Rico, where you can find a range of shops, bars and restaurants. Car hire can be arranged at reception, and there is easy access to highway GC-1. The popular Maspalomas resort is around 12 miles away. Set in a tranquil area only 10 minutes by foot from Playa de Puerto Rico, this hotel is a comfortable place to enjoy the great climate of Gran Canaria any time of the year. The Apartementos Tamanaco have one bedroom and are comfortably equipped to create a relaxing atmosphere. Relax at the end of a day on the beach in the heated swimming pool and on the sun terrace. Its convenient location means you can enjoy the nightlife of the area. You can also buy everything you will need in the nearby shopping centers. On a hillside in Puerto Rico, Bahía Blanca overlooks the Atlantic Ocean. It offers a pool, tennis courts and apartments with a private terrace offering fantastic sea views. The apartments at Bahía Blanca feature tiled floors and calming blue décor. There is a sitting area with satellite TV and a kitchenette with a stove and microwave. They each come with a fan. Recreational facilities include a fitness center, hot tub and sauna. There is a varied entertainment program for adults and children, including rifle shooting, scuba diving and excursions. Breakfast is served daily at the hotel’s poolside bar. The restaurant offers Spanish and International food, and there is a mini-grocery store on site. The Bahía Blanca is a 30 minute drive from Gran Canaria Airport. Set on the hillside overlooking Puerto Rico, this charming bungalow complex is located only 5 minutes from the beach. It offers 2 outdoor swimming pools. Nido del Aguila provides a tranquil setting, where you can relax and enjoy the sun. It is set on the edge of the coastal town of Puerto Rico in the south of Gran Canaria. These are ideal accommodations for a family stay, or with a group of friends. You can spend the day soaking up the sun and relaxing by the swimming pool with the whole family. Each of the bungalows in Nido del Aguila is well equipped with an kitchen and a lounge area where you can unwind in the evening. There is a restaurant and bar in the complex where you can enjoy a light lunchtime snack, or a more hearty evening meal. It serves English-style cuisine. Ideal for a break in the attractive resort of Puerto Rico, these modern apartments are set just a short walk from the amazing beaches of southern Gran Canaria. The setting of the Apartamentos Roslara allows you to enjoy your days on the golden sands of Puerto Rico and Amadores beaches, just a 10-minute walk away. When not taking advantage of the year-long sunshine and clear waters at the beach, head to the property’s outdoor swimming pool for a refreshing dip. Spacious apartments all come with lounge-dining rooms and kitchenettes with refrigerators. Preparing your own meals in the kitchen is made easy by the on-site mini-market. Finish off a day of relaxation with a drink in the Roslara’s bar. This comfortable venue also serves a delicious breakfast each morning. This large and well-equipped apartment complex is situated in the resort of Puerto Rico, in the south of Gran Canaria – ideal for a fun-filled vacation in the sun. Terrazamar Sun Suite is built on a valley side and has terraces on various levels offering great views of the valley and the Atlantic Ocean. You can also choose to relax and sunbathe on the large private terrace of your own apartment. Take a dip in the large on-site swimming pool or lie back in comfort on the lounge chairs. You can also get active by playing a game of tennis on the complex’s courts. Use the Terrazamar as a base to visit the famous beaches of Puerto Rico, less than a mile from from the complex. These cheerful apartments with pool are set just 5 minutes from the beach and close to the resort center. Choose between the self-catered facilities or the complex’s great English-style bar and restaurant. Take the 5-minute bus ride to golden sands and safe waters of Puerto Rico Beach. Or, soak up the sunshine on the sun terrace of the Lara complex. Cool off in its swimming pool or enjoy a siesta in the shade of the exotic plants and flowers. Cook up a feast in the open-plan kitchens and then dine with friends in the lounge-dining area. The apartments are bright and airy with traditional details such as the wooden furniture and cooling, tiled floors. The Lara Apartments are conveniently located near the resorts shops and supermarkets as well as recreational facilities such as racquetball and tennis courts. Set overlooking the sea, Apartamentos Casablanca are ideal accommodations for spending a relaxing vacation in the sun on the island of Gran Canaria. Lie back and soak up the sun on one of the loungers or hammocks surrounding the complex’s swimming pool. There is also a spa center and fitness suite on site, where you can enjoy a range of treatments or a relaxing massage. Casablanca has a restaurant where you can have a buffet lunch, or a more formal sit-down meal in the evening. After dining, you can sit back with a drink in the poolside bar. The apartments in the Casablanca complex boast balconies or terraces with views of Puerto Rico and the sea. Spend a relaxing vacation soaking up the sun in Montebello complex, which has spacious and well-equipped apartments with large terraces, providing great sea views. Located in the coastal town of Puerto Rico, in the south of Gran Canaria, these apartments are an ideal base for a beach vacation – Puerto Rico beach is 765 yards from the complex. You can also relax in the complex, by soaking up the sun in a hammock or taking a dip in the cool waters of the swimming pool. Each of the apartments in the Montebello complex have large terraces where you can sit back and enjoy sunbathing, admiring great views of the Atlantic Ocean. They are also equipped with kitchens, which allow you to prepare your own meals. Aparthotel Altamar is set above Gran Canaria’s Amadores Bay, with impressive sea views. The apartment-style hotel has an outdoor swimming pool and attractive gardens. Altamar offers spacious studios and apartments, with large terraces and sea views. They all have a ceiling fan, satellite TV and a safe. The well-equipped kitchens have a ceramic stove and a fridge. The hotel is just 440 yards from Amadores Beach, in a quiet area of Puerto Rico. Anfi Tauro Golf Course is nearby. The apartment-style hotel offers free parking on site. The Altamar has a restaurant and snack bar, open all day. It also has a 24-hour reception, a grocery store and a self-service laundry. Free Wi-Fi access is available in public areas. The apartment-style hotel also offers baggage storage. There is a courtesy room with shower, for use after check-out. Spend a relaxing family break around the outdoor swimming pool of this typical Canarian apartment property, located in the charming resort of Puerto Rico. At the Eden Apartments you can lie back on a poolside lounge chair and soak up the year-round sunshine of Gran Canaria. Then cool off with a dip in the pool, complete with its own water fountain and crossed by a little bridge. At the same time, children can play safely in their own pool. During the day, you can enjoy the fun activity program for the whole family, including water polo and aqua aerobics. Or, simply enjoy the ocean views from the scenic rooftop terrace. Entertainment such as live shows and music is also provided in the evening. Just a short walk away you will find a wide range of restaurants and shopping at the Europa Center. You can also take the one mile stroll down to the beautiful sands of Amadores Beach. The modern Altamadores apartments are situated just half a mile from the Playa de los Amadores beach. They have swimming pools, entertainment and wonderful views. The apartments are decorated in a contemporary style. Each has a large terrace, satellite TV, separate bedroom and dining-living room. The kitchen has oven-microwave, stove, fridge, coffee maker and toaster. Some have views of Amadores Beach and bay. Wi-Fi access is available upon request. One of the swimming pools is heated years round. Beside the pools are large sun terraces with free lounge chairs. There are plenty of children’s activities, including a mini club. The hotel has free parking. Altamadores is well located for the shopping and nightlife of Puerto Rico, in south Gran Canaria. The Europa Shopping Center is less than one mile away. The luxurious Anfi Opal villas in southeast Gran Canaria are less than half a mile from the Atlantic Ocean. All have private swimming pools, hot tubs and plasma-screen satellite TVs. All the modern, air-conditioned villas feature stylish and minimal design. Each one has large grounds and a private terrace. The large, open-plan kitchens include dishwashers, microwave and fridge-freezers. There is also a large sitting area with sofas, and all bedrooms have private bathrooms. There is satellite TV in the bedroom and sitting room. Anfi Opal forms part of the Anfi Tauro complex, which also includes an 18-hole championship golf course. Guests enjoy discounted green fees. There are also on-site racquetball and paddle tennis courts. Gran Canaria Airport is just a 40 minute drive away, while the resort of Puerto Rico is just half a mile away. The Anfi Tauro complex offers free parking. 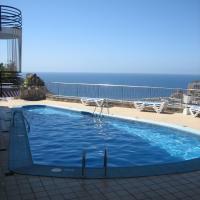 Serenity Amadores is a luxurious apartment complex with a large outdoor swimming pool. It has a quiet setting, with views of a beach in southern Gran Canaria. Each apartment has 1 bedroom, a small kitchen and a large terrace with sea views. There is a comfortable living area with a TV. The Serenity Amadores complex has a mini-market, and a reception with a tour desk. A professional massage service is available, for an extra fee. Car rental is also available from reception. Free private parking is offered on site. In Gran Canaria’s Puerto Rico, Apartamentos Palmera Mar features a heated outdoor pool with hydro-massage, a restaurant and small grocery store. All Palmera Mar Apartments have a well-equipped kitchenette, with a fridge, microwave and coffee maker. Satellite TV is available for an extra fee. Most apartments feature a furnished terrace with spectacular views of Amadores Beach. You can enjoy the sunset from the poolside bar at the Palmera Mar. There are also various bars and restaurants within a 15-minute walk of the property. 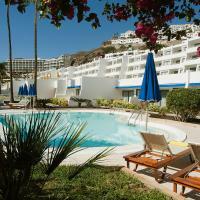 The Palmera Mar is on a hill above Amadores Beach, in a quiet area of Puerto Rico. It offers wonderful views of the coast and the Atlantic Ocean. The staff at the apartments’ tour desk can provide more information about the area. This recently renovated property offers spacious and well-equipped apartments just 5 minutes from the beaches of Puerto Rico – ideal for a family break on the beautiful island of Gran Canaria. Take advantage of the year-long sunshine of the Canary Islands with a dip in the property’s heated outdoor swimming pool. Beside here you will find a snack bar, providing you with refreshing drinks as you soak up the sun. Each apartment at the SunSuites Lufesa comes equipped with a kitchen and utensils, and opens onto a furnished terrace or balcony. Fans and double glazed windows ensure that you can sleep comfortably at night, and you will find a satellite TV with international channels in the lounge area. Lufesa lies in the centre of Puerto Rico, just a minute's walk from the shopping centre. You can also visit the nearby water parks or take the bus ride to the island’s capital, Las Palmas. The Morasol Suites, next to Puerto Rico’s marina on Gran Canaria, offer wonderful sea views. The beach is 440 yards away, and the air-conditioned rooms and apartments all have satellite TV. All of the accommodations at Morasol Suites have a kitchenette with microwave and fridge. They also have large windows offering panoramic views. Within a 10-minute walk of the hotel you can find a diving school, and tennis and racquetball courts. The area also has a number of shopping centers. The Morasol Restaurant serves international cuisine and twice a week features live music. For dinner you can choose between buffet and menu dining. In Puerto Rico, on Gran Canaria’s south coast, the Riosol offers apartments and rooms with a furnished balcony and sea views. It has 3 swimming pools, a tennis court and a gym. 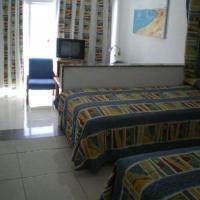 Apartments at the Aparthotel Riosol have one or 2 bedrooms, a bathroom and a spacious sitting area with satellite TV. Kitchens come with a ceramic stove, microwave and toaster. The Riosol’s restaurant serves an international buffet for breakfast and dinner, where gluten-free menus are available on prior request. The hotel also contains its own grocery store, which is open 12 hours a day. The hotel has a game room with a pool table and video games. There is also a play area and a kids' club for children. Free Wi-Fi is available in the lobby. At nearby Amadores Beach in Puerto Rico, guests can enjoy scuba diving, windsurfing and boat trips with a chance of seeing dolphins. Set beside Puerto Rico Marina in Gran Canaria, this modern apartment-style hotel provides views of the Atlantic Ocean from its outdoor swimming pool. All rooms have satellite TV and a private balcony. All of the Marina Suites have free Wi-Fi and air conditioning, and are decorated in white. They all feature a kitchen with a stove and a microwave, and the private bathrooms contain a hairdryer. The Marina Suites’ buffet restaurant serves Mediterranean food and organizes themed dinners. The Yacht Club Bar has board games and a big screen. The hotel’s fitness center has 2 outdoor spa bathtubs. The front desk is open 24 hours a day, allowing you greater flexibility during your stay. The Anfi Tauro Golf Course is just a 5-minute drive from the Marina Suites. Amadores Beach is a 10-minute walk away. The chic Marina Bayview is built into the hillside overlooking Puerto Rico Harbour in Gran Canaria. It features a large outdoor pool and terrace with impressive Atlantic Ocean views. Apartments feature a private balcony or terrace. All have air conditioning, and a kitchenette with a fridge, coffee maker, teakettle and toaster. There is satellite TV and a private bathroom. The restaurant by the pool offers spectacular views of the harbor. Paddle and tennis courts are just a few feet from the complex, and Salobre Golf & Resort is 9 miles away. Discounts are provided to Marina Bayview guests. The resort has a 24-hour front desk and also has car rental. Free parking is available nearby. Set on a cliff top, Puerto Azul Amadores enjoys fantastic views of Puerto Rico Bay. It offers tennis courts, mini golf and 2 outdoor swimming pools, one heated in winter. Hotel Puerto Azul offers a large terrace with panoramic views, including an adults-only chill-out area with lounge chairs and hot tubs. There is also access with steps to the beautiful Puerto Rico Beach. Each modern apartment opens onto a balcony with views of the Atlantic Ocean. Apartments include a kitchenette, and the lounge has a plasma-screen TV with satellite channels. The staff at the apartment-style hotel can provide information about the island of Gran Canaria. They also organize activities and daily entertainment for children and adults. The Puerto Azul Amadores has a buffet restaurant, cafe and poolside bar. The handy on site grocery store means guests can also cook in their apartments, and Europa Shopping Center is just 100 yards away. Set in tropical grounds, with 2 outdoor pools, these apartments are 440 yards from Amadores Beach and Marina, in Gran Canaria’s Puerto Rico. Rooms have private balconies with Atlantic Ocean views. The family-owned Maracaibo Aparthotel offers bright, colorful rooms with hardwood floors and satellite TV. Air-conditioning is available upon request. Modern kitchens are equipped with a microwave, fridge, toaster and teakettle. Aparthotel Maracaibo has a gourmet restaurant and Caribbean-style bar. On-site dining includes the tasty barbecue, which is accompanied by live entertainment. There is a 24-hour mini-market on-site and a good choice of stores and restaurants nearby. The apartments also feature a children’s play area. There is free public parking nearby. Set high up in Puerto Rico in the south of Gran Canaria, this apartment complex has wonderful sea views from its sun terrace and outdoor pool. The Monteparaiso apartments each have a bedroom, a lounge with a sofabed, a fully equipped kitchen, and a bathroom. There is a furnished terrace with views of the bay. Monteparaiso has 2 pools, one for children. There are free sun beds and parasols. There is also a poolside snack bar. Opposite Monteparaiso is the Europa Shopping Centre. These apartments in Puerto Plata offer easy access to the beach, large swimming pool and free lounge chairs. They also have impressive sea views and easy access to public transportation. The studios have a kitchenette with fridge and stove. They also have a bathroom and balcony or terrace. Wi-Fi is available throughout the hotel upon request. TVs can be rented from reception. The Aparthotel Puerto Plata has large gardens, a freeform swimming pool and sun terraces. There is a social room, grocery store and hairdresser. The hotel also offers car rental. The restaurant has panoramic views of Puerto Rico. For something lighter, there is a snack bar. The pool bar offers drinks, pastries and ice cream, while the ‘Ellington’ music bar offers cocktails and dancing. There is free on site public parking. The hotel is close to public transportation services that can take you to other parts of Gran Canaria. Apartamentos Portosol are a 5-minute walk from Gran Canaria’s Puerto Rico Beach and Harbor. The complex has an outdoor pool, sun terrace and rooms with balconies. Each Portosol Apartment has a sitting area and safe. There is a full bathroom, a living room and a small kitchen with a fridge. Apartments also have coin-operated TVs. The Portosol complex is less than half a mile from the resort’s shops, bars and restaurants. Anfi Tauro Golf Course is around one mile away. Guests can rent a car from the front desk to explore the island. Free public parking is available on site. The Río Piedras is 300 ft from Puerto Rico Beach, in southern Gran Canaria. The complex has a top-floor swimming pool with impressive sea views. The building has a large terrace on the roof with free lounge chairs. Here there are views of the sea, the beach, a park and of the valley of Puerto Rico. All apartments at the Río Piedras have a balcony or terrace. There is also a small kitchen with a fridge and teakettle. Satellite TV is also included. There are supermarkets within 650 ft of the complex. The Puerto Comercial Shopping Center is a 5-minute walk away. There are 3 golf courses within 12 miles of the property. These apartments have a quiet location in the Puerto Rico resort of Gran Canaria. The complex has an outdoor swimming pool and beautiful views of the sea and the marina. Apartamentos Tindaya is set on a hill in Puerto Rico, with an attractive garden. All apartments have great views. Apartments at the Tindaya come with a private balcony or terrace. They also have satellite TV and a DVD player, as well as a kitchenette with a microwave. The Tindaya is within a 10-minute walk of the center of Puerto Rico. Anfi Tauro Golf Course is also nearby and a car rental is available on site. With exceptional views out over the Atlantic Ocean, these apartments have great facilities including a outdoor pool and tennis court. All apartments have a private balcony or terrace. Thanks to the short distance from your Blue Star Apartment down to the beach of Gran Canarias Puerto Rico, you can be enjoying fantastic views and a swim in the sea within minutes. The Amadores Beach is 1.5 miles away and the Puerto Rico just over a mile. Refresh yourself with a drink from the poolside bar. Later, head to the restaurant located on the 8th floor for a good choice of varied cuisine. Both venues enjoy a pleasant nightlife where you can unwind with other guests and enjoy the long, warm evenings. Admire the scenic views as you walk around the Blue Star complex. Cool off from the heat in the swimming pool - there is a separate pool for kids as well as a play area. Just a 5-minute walk to the beach, Apartamentos Natural Park boasts modern apartments with views of Puerto Rico town, on the Gran Canaria. Natural Park complex has a large, outdoor swimming pool - the ideal place to spend the day unwinding and soaking up the sun with friends or family. Alternatively, you can stroll to the nearby beach, relax on the fine sands and swim in the Atlantic Ocean. Each of the apartments in Natural Park comes with a balcony with sea views, where you can also enjoy sunbathing in privacy. In the lounge of the apartments you will find a TV and plenty of space for relaxing with friends or family. After a long day in the sun, head down to the complex's restaurant for a spot of dinner. Follow your dinner up by going to see the evening entertainment, programmed by the complex. Natural Park also has a 24-hour reception desk, so you can come and go as you please. These apartments overlook the Atlantic Ocean and Gran Canaria's Puerto Rico. Swim in the outdoor pool, relax on your private balcony and prepare meals in the well-equipped kitchens. Babalu allows you to make the most of Gran Canaria's sun, sea and sand with these fantastic self-catered apartments. Each apartment has one bedroom and can sleep up to 2 adults and 2 children. Prepare meals together as a family, or group of friends, in the kitchenettes before relaxing in the cheerfully decorated lounge area. Grab a snack from the bar or head out to the nearby restaurants in the Puerto Rico resort. Thanks to the Babalu's position, you can easily reach everything on foot. Set in a quiet location in the popular Puerto Rico resort, the Apartamentos Cumana boast well-equipped accommodations, with private terraces, and an outdoor swimming pool. Relax in this modern complex in the beautiful Mogán region, full of tropical plants and flowers, considered the best microclimate in the world by UNESCO. Apartments have a fridge and full kitchenette, so you can cook your own meals, and a terrace with sea views. Sunbathe on Puerto Rico’s golden beaches, or grab a drink by the Cumana’s pool. There are also 2 great public pools nearby. Wander 220 yards down to Puerto Rico’s main shopping center, where you will find a range of bars and nightlife. Make the most of the Cumana’s location, and free parking on site, to explore this lively area. Enjoy jet-skiing, sailing, scuba-diving, and windsurfing, swim with dolphins, or take a glass-bottom boat trip to observe the sea life. Apartamentos Los Veleros offer an outdoor swimming pool. They are 1700 ft from the beach, in the resort of Puerto Rico, Gran Canaria. The apartment complex is on a hill just above the lively center of town. It has wonderful views of the bay. Each apartment at Los Veleros has a balcony, and a comfortable lounge with sofa bed and coin-operated satellite. The kitchens have a fridge and a ceramic stove. The apartment complex has a pretty sun terrace and garden. There is also a pool table, and a children’s play area. Las Villas de Amadores is located near a lookout point over Amadores Beach, with free private parking available. 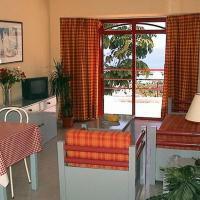 The spacious apartments offer a flat-screen TV, Wi-Fi and sea views. The Amadores Villas all have a private balcony and a hydromassage shower in the bathroom. The well-equipped kitchen includes a washing machine and the apartments have stylish, modern design. The complex is set around an outdoor swimming pool, with views of the sea. There are panoramic elevators, as well as a large terrace and a garden area. The Anfi Tauro Golf Course is within walking distance of the Villas de Amadores. The area is ideal for hiking and windsurfing. Massages and bike rental are possible on site. Apartaments at Cala d’Or come with a balcony and views of the Atlantic Ocean. The complex offers a heated outdoor pool, a 24-hour mini market and free private parking. The Cala d’Or complex includes tropical gardens with palm trees and cacti. A snack bar and sun terrace are next to the pool. There is a full entertainment at night and during the day. These include live dance shows and music. Pool and shooting competitions take place during the day. The bar serves tropical cocktails and ice cream, as well as snacks. There is also a TV screen to follow live sport. The apartments at Cala d’Or are set on 3 floors. Each has an open-plan kitchen/living room with a microwave, a teapot and a toaster. Drinks for the fridge are available at the on-site mini market. The large Apartamentos Florida are in the southeast of Gran Canaria. They have a swimming pool heated by solar panels. Each Florida apartment has a private terrace or balcony, lounge-kitchen and bedroom. The kitchen has a stove, coffee-maker, fridge, toaster and teakettle, while the lounge has a TV. The bedroom has a large wardrobe. All rooms have views of the pool and grounds. Next to the swimming pool are 2 large terraces for sunbathing, with lounge chairs and sun umbrellas. The beach is just half a mile away, while shops and restaurants can be found within easy walking distance of the property. Gran Canaria Airport is about 25 miles away. Overlooking Gran Canaria’s Puerto Rico Bay, the family-run Gelimar Apartments offer an outdoor pool surrounded by terraces and gardens. Each simple apartment has satellite TV and a private terrace with sea views. All Gelimar apartments have tiled floors and a spacious living room with a sofa bed. Kitchenettes include a microwave, fridge and coffee maker. Wi-Fi is available at an additional cost. Staff at Apartamentos Gelimar can provide information about the area and arrange airport transfers or car rental. Free parking can be found in the surrounding streets. The Gelimar is within 15 minutes' walk of Amadores Beach and Puerto Rico Harbour, where there are many bars and restaurants. The nearest supermarket is 150 metres away. Anfi Tauro Golf Club is a 10-minute drive away, while Playa de Inglés is less than 20 km from the apartments. Pets are welcome at Gelimar, and a veterinarian service is available if necessary. Apartamentos Miami are set in gardens, around 100 metres from the beach in Puerto Rico. These well-equipped apartments offer accommodation with balconies or terraces, and an outdoor swimming pool. The Miami’s apartments are spacious and brightly decorated. Each has a kitchenette and a seating area with a TV. The complex is set 200 metres from the centre of Puerto Rico, where there are a range of shops, bars and restaurants. The Miami has an on-site supermarket and there are also vending machines selling hot and cold drinks. Apartamentos Miami are ideally located for watersports, including sailing and fishing. The nearest golf club is just over one kilometre away. Palmasol Apartments are a 10-minute walk from Puerto Rico Beach and marina, Gran Canaria. All apartments have a private balcony, and there is an outdoor pool and free parking nearby. All of the bright Palmasol apartments feature a living room with a flat-screen TV and sofa. The well-equipped kitchens come with a fridge, microwave and coffee maker. The Palmasol has a garden area and there are sun loungers around the pool. Dolphin and whale watching boat trips leave from the marina. Anfi Tauro Golf Course is a 10-minute drive away, and there is easy access to the GC1 Motorway. The Arimar Apartments are located in the Puerto Rico resort on Gran Canaria, 660 yards from the beach. There is a swimming pool, and all apartments have a private balcony. The Apartamentos Arimar complex is just 330 yards from the center of the lively resort, where you will find bars, restaurants and stores. The Arimar complex has a sun terrace with lounge chairs and a snack bar. The Arimar’s tour desk also offers currency exchange and car rental. The apartments all have a lounge and a kitchenette with microwave, tea-making facilities and kitchenware. Some of the apartments have panoramic views of the marina. Located in a quiet area of Gran Canaria’s Puerto Rico, Guanabara Park Apartments offer an outdoor swimming pool, sun terrace and gardens. Each apartment includes a balcony and satellite TV. All Guanabara Park apartments have a bright living area with a sofa bed and dining table. There is a private bathroom and a kitchenette with a fridge. Local and international dishes are served in the Guanabara’s restaurant. There is also a bar on site. The reception offers currency exchange and car hire services. The apartments are situated one kilometre from Puerto Rico Marina, and around a 20-minute walk from the beach. Free public parking can be found nearby. El Greco apartments are situated in the resort of Puerto Rico with direct access to the beach. The swimming pool and jacuzzi enjoy beautiful views of the sea and marina. The spacious and modern El Greco Apartments all feature a private balcony or terrace and free Wi-Fi. The kitchen includes a microwave and fridge, and the lounge area comes with a flat-screen TV. Gran Canaria Airport is just a 30 minute drive away. Free parking is available on site and car rental can be arranged for guests. Guests can enjoy meals at the grill restaurant and there is also a snack bar on the terrace by the pool. El Molino del Greco is an authentic Italian restaurant serving fresh, homemade pastas and pizzas. 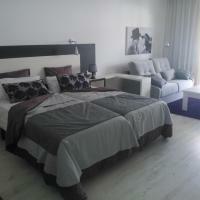 Apartamentos El Greco are cleaned daily and the sheets are changed twice a week. Towels are changed every 2 days. Just 150 metres from the beach in Puerto Rico, Malibú Apartments have a heated outdoor pool. All bright and spacious apartments have a balcony and some offers a sea views. Each apartment boasts a living room with sofa and a modern bathroom with shower. The kitchenette has a fridge and an electric cooker. The Malibú complex feature a bar, a restaurant and a mini supermarket. A large shopping centre can be found 800 metres away. The Malibú Apartments have a large sun terrace with loungers and a children's swimming pool. The complex also features a tennis court and you can hire a car and have more local tourist information at reception. Free public parking can be found nearby. Apartamentos Las Buganvillas is in a pretty setting overlooking the Atlantic Ocean, half a mile from the beach. This complex has an outdoor swimming pool, free Wi-Fi and well-equipped apartments with balconies. Las Buganvillas offers brightly decorated, spacious accommodations. Each apartment has a sitting area with satellite TV and a kitchenette. Guests can use the Buganvilla’s snack bar, or dine in one of the nearby restaurants. The complex is located next to the Europa Shopping Center and is within a 10-minute walk of the center of Puerto Rico. The apartments are just 1700 ft from Anfi Tauro Golf Course. There are several daily boat trips which leave from the port, around half a mile from the Buganvillas. Terraza de Amadores is 1200 ft from Amadores Beach, in southern Gran Canaria. It offers an outdoor pool, and all apartments have a private balcony with superb Atlantic Ocean views. Each Amadores apartment has a living room with a TV and sofa bed. There is a safe, and a private bathroom with a shower. The well-equipped kitchenette comes with a fridge, microwave and coffee maker. The complex has a poolside bar and a snack bar. There is a grocery store on-site, and room service is available. Terraza de Amadores has a grounds area and a terrace. There is a pool table and massage can be requested. You can rent a car at the complex, and free parking is available nearby. Anfi Tauro Golf Club is a 5-minute drive away. Internet connection, via modem, is offered in public areas for a supplement. The Miriam Apartments offer an outdoor pool with a sun terrace and snack bar, overlooking Gran Canaria’s Puerto Rico Bay. Each functional apartment has a private balcony with ocean views. Apartamentos Miriam are within a 10-minute walk of Puerto Rico’s sheltered beach and harbor. Free parking can be found nearby, and the lively resort of Playa del Inglés is less than 12 miles away. Each Miriam apartment has simple décor and tiled floors. There is a lounge with satellite TV and a sofa bed. Kitchenettes include a ceramic stove, microwave and toaster. Apartamentos Miriam has an on-site mini market, and various shops and bars can be found in central Puerto Rico. These spacious, modern villas offer a private swimming pool, flat-screen satellite TV and balconies with impressive views of the sea and mountains. Amadores Beach is only one mile away. The Mirador del Mar Villas are situated in Puerto Rico, in southern Gran Canaria. The Europa Shopping Center is a 10-minute walk from the complex, and regular bus services stop nearby. Each simple, elegant Mirador del Mar villa has a main bedroom with a private terrace and private bathroom. There is also a second bathroom and a half bathroom for guests. Guests at Mirador del Mar can prepare meals in the well-equipped kitchen, which includes a dishwasher and a washing machine-dryer. There is also a barbecue on the grounds. Each villa comes with a free private parking space. 1700 ft from Gran Canaria’s Amadores Beach, Gran Amadores Apartments offer an outdoor pool and on-site minimarket. The spacious apartments come with a fan and a private balcony. Featuring tiled floors, each apartment has a living room with a sofa bed, safe and TV. The private bathroom comes with a hairdryer. In the kitchenette you will find a fridge, microwave and coffee maker. You can play billiards at Apartamentos Gran Amadores, and there is an internet corner with coin-operated computers. Car rental and currency exchange are available at the Gran Amadores tour desk. Anfi Tauro Golf Course is one mile away and there is easy access to the GC1 Highway.